Any director who attempts to adapt a memoir into a feature film is confronted with a myriad of challenges. The text will inevitably be telescoped but what to eliminate and what to emphasize, especially given that with the memoir genre, the author’s decision to conceal is as important as what he reveals? Should the film maintain the memoir’s structure of a chronological overview or revert to flashbacks? What about the choice of casting: should the filmmakers be looking for actors with cinematic appeal or attempt to search out individuals who closely resemble in appearance, age and mannerisms the characters in the memoir? And perhaps most important: with the choices above already made, can the film be true to the spirit of the memoir? As horrific as conditions were, worse followed when Lomax’s captors discovered a contraband radio and a map he had carefully drawn of the railway line. He and five others close to him were interrogated and savagely beaten. His arms, wrist, several ribs, teeth, and his hip were broken. Two died from the beatings. While Lomax survived, more torture followed in the days after, including waterboarding and being locked up in a bamboo cage the size of a large dog crate. Lomax was able to offer this searing account of his war experiences because he wrote an early draft while recovering from the bone-crushing bludgeoning inflicted on him by the Japanese before returning home to Scotland. It’s a wonder he survived with limbs as mangled as his psyche. (There is a ludicrous scene in the film when the camp he is in is liberated and he stands up to greet one of his liberators. In reality Lomax was condemned to a number of horrific prisons in and around Bangkok where he barely survived his injuries.) The physical damage was one thing but much more difficult was trying to escape during the next half century the vice-grip of his memories as a haunted POW characterized by terrifying flashbacks – wartime traumas re-experienced rendering it difficult to distinguish between illusion and reality – nightmares, emotional withdrawal and sudden outbursts of anger. 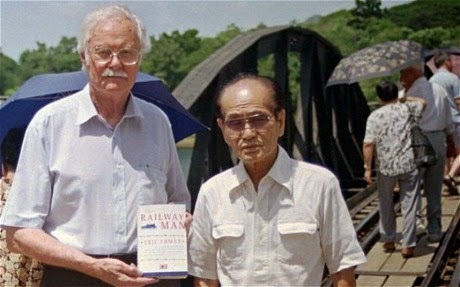 Eric Lomax and ex-Japanese soldier, Takashi Nagase. Although the last third occasionally sheds important insights about post-traumatic stress disorder (PTSD), the memoir’s generally elliptical account of his post-war life leaves the reader feeling dissatisfied. Not being an introspective man, his book rarely gets beneath the surface in his psychic journey. Lomax does reveal his discomfort with ambiguity and any official demands; even paying bills became intolerable to him. He was not likely alone. In correspondence with his former chaplain in the hope of finding out more about the identity of his torturers and the “American” interpreter who supervised the beatings in 1943, Lomax discloses that the padre gave up the uncertainties of religion for the certainties of mathematics. Later when he is willing to talk and meets first with Helen Bamber who established the Medical Foundation for the Care of Victims of Torture and his personal therapist, the physician Stuart Turner, Lomax says more about their fine qualities than he does about his own two-year therapy and how he confronted his demons, including his deeply ingrained hatred toward the Japanese. Throughout the memoir, Lomax was exceedingly diffident in doling out personal biographical details. He briefly alludes to the fact that he has a fiancée, then that he is married to a woman referred to only as S shortly after his repatriation when they hardly knew each other. Early on, he might have been willing to talk about his experiences but S could only think of the war as rationing, air raid warnings and blackouts. He shuts down and is not able to talk to anyone about his traumas until after his retirement as a railroad industrial relations expert. 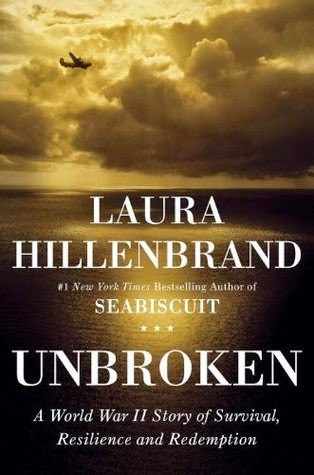 Speaking of himself in the third person, he acknowledges that “much of his emotional life was ripped out of him.” In the meantime, his nightmares begin, the couple have two daughters –a son dies a day after he is born – and they drift apart and he leaves it completely in 1981. Apart from two paragraphs about his daughters and conceding the fear that former POWs may have genetically harmed their children, Lomax says nothing, perhaps from guilt, about how his anger affected his family. 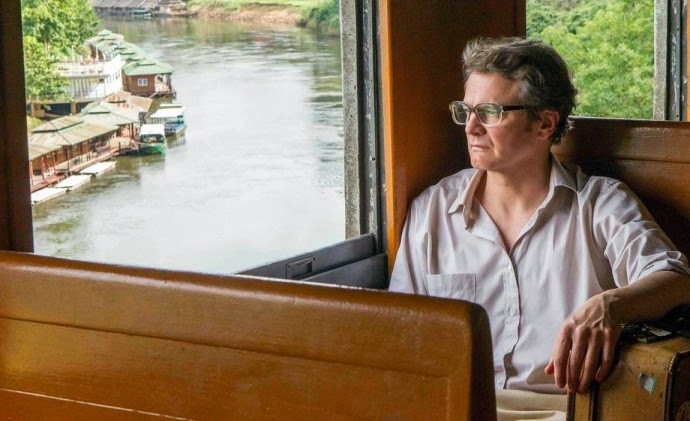 Colin Firth as Eric Lomax in The Railway Man. 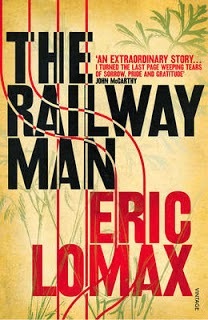 None of this personal material about his post-war life enters the film, The Railway Man. Colin Firth as Lomax initially appears as a lonely bachelor, an introverted, quiet and somber man. He comes alive only when talking about railroads or railway schedules. Fittingly, he meets his future wife Patti (played by Nicole Kidman) on a train and their romance begins with him talking about the one subject with which he is comfortable. Within a short time they are married although in real time it was three years. It strains credibility that Patti only sees the first sign of his PTSD on their wedding night when she awoke to find him thrashing and screaming in pain. Firth is at least a decade too young but readily conveys Lomax’s icy silence and terrible agony. Flashing back in time, Lomax, as a younger man played by Jeremy Irvine (an excellent casting choice because he resembles a young Firth and he is also adept at radiating a steely countenance), recalls what I have already recounted from the memoir. The gruelling labor and the Japanese brutality are vividly captured and shown to be far worse than portrayed in David Lean’s 1957 film, The Bridge on the River Kwai. Director Jonathan Teplitzky’s depiction of the beatings of suspected spies and Lomax’s repeated waterboarding are unflinching and difficult to watch. Some viewers might regard the frequent flashbacks as a distraction, or an annoyance, but I felt that Teplitzky might have been more imaginative in its use. Current anxiety-producing situations could have set off harrowing memories rather than inserting a fictional device in which Patti pleadingly asks one of Eric’s friends and fellow veteran, Finlay, about that time. Teplitzky and the script writers, Andy Paterson and Frank Cottrell Boyce, could have made better use of Kidman in the film had they reached more into the memoir. In it Patti is more aggressive than in the film not only in searching out psychological help for her husband but in her response to the Japanese officer and interpreter, Takashi Nagase. He was present at Lomax’s torture and Eric focused his hatred on this man because he spoke English. Nagase published his autobiography in which he mentioned the torture of Lomax. Patti, upon reading the English translation of the book, decided to write to Nagase regarding her husband without informing him. To her surprise, he wrote back. It was these letters that set in motion a chain of events that led to the 1993 meeting between Lomax and Nagase in Thailand, both in their seventies. That rendezvous took place near the bridge over the River Kwai, the infamous stretch of Death Railway immortalised in a 1957 film. Footage from the day shows two grey-haired men tentatively shaking hands. Near the end of The Railway Man, the film veers off in a wrong direction setting up a blind meeting as a potential opportunity for Lomax to avenge his hatred. He did nourish revenge fantasies before he met Patti and in the early period of their relationship, but that was before his own therapy, something the film does not even mention. Had Teplitzky presented this scene as an early revenge fantasy, it might have worked, and the contrast with the final scene would have been starker. The film also does a disservice to Nagase; it never acknowledges the man’s illness and his own PTSD. Deeply remorseful, he dedicated his life after the war to help the Allies locate graves of POW’s to “make-up” for the wrongs the Japanese army had done. In the film, the older Nagase is merely working as a tour guide; in real life, he made repeated pilgrimages to Thailand and worked for reconciliation between former POWs and Japan. It was not outlandish for him to believe that he had been “forgiven.” The emotionally difficult journey that both men took before they met each other was far more nuanced and longer in real time than suggested in the film. Initially, Lomax scoffed at the idea of reconciliation given his abiding hatred for the Japanese in general and Nagase in particular, and it took a long time before they corresponded with each other. From the book, it is possible to believe that Lomax exorcised his demons; in the film, it strains our credibility too much. Had it been directed with more subtlety and imagination what occurs in the final scene would have carried an even greater powerful wallop and been more believable. 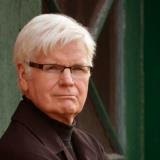 – Bob Douglas is a teacher and author. His second volume to That Line of Darkness: The Shadow of Dracula and the Great War (Encompass Editions, 2011) is titled That Line of Darkness: Vol. II The Gothic from Lenin to bin Laden. You can find more at his website: http://www.thatlineofdarkness.com.